Every stereotype, no matter how absurd the caricature, has, at its core, a grain of truth. Though I doubt anyone has ever seen him, the beret and black and white hooped sweater-sporting Frenchman with a cigarette hanging off his lower lip and a baguette under his arm, remains an abiding image of France; and in spite of daily experiences to the contrary, the sombrero-wearing bandolero with extraordinarily fecund mustaches framing a gold tooth persists in many people’s minds as the look of the typical Mexican. Similarly, in the American imagination, the British are all highly genteel, pale-skinned folk, who sip tea out of dainty bone china cups at exactly four p.m. every day, and take tiny bites out of their cucumber sandwiches to avoid baring their horrific teeth. Of course, most Brits are more likely to be swigging gin or alcopops from a tin mug than Earl Grey by the time four o’clock comes around, but as with French and Mexican stereotypes, these outdated notions retain an element of truth. In this case, the Victorian era high-tea of, well, tea and various sandwiches and cakes isn’t a tradition that has survived intact. However, the summertime practice of taking ones tea (meaning the meal here) out of doors in a kind of impromptu and slightly lame picnic is still going strong, particularly since the tea (meaning the drink here) is commonly replaced by another Victorian era stalwart, Pimm’s. As I wrote last year, prior to the industrial revolution, London’s East End and Docklands area was known for the quality of its shellfish. The large tidal range on that part of the Thames revealed great and healthy mudflats at low tide from which bushels of cockles, mussels, winkles, razor clams, and oysters were pulled. This bounty of shellfish meant that oyster bars were as much a part of East End life as rhyming slang, and it was typical for your working man to wash down each mouthful of crustacean with a jigger of dry gin. Now, if you’ve ever drunk cheap London dry gin neat, you’ll know that the bitter flavor can turn even the toughest Cockney’s mouth inside-out and have him clutching the Betty Grable for support. So it was that in 1823, East End oyster bar owner James Pimm began serving a drink that mixed gin with quinine, citrus fruit, and spices to make it more palatable. Pimm’s cocktail, or No.1 Cup, as it became known after the small tankard it was served in, quickly became a hit, and before long even the posh folks of London’s West End were quaffing it as “The Original Gin Sling”. So popular was his beverage, that James Pimm introduced two other kinds of Pimm’s cups to London drinkers: numbers 2 and 3, based on scotch and brandy, respectively. Indeed, by the late 1880s, Pimm’s had established itself such a following that even when the Pimm family sold their business – to no less than Sir Horatio Davies, member of Parliament and (at the time) Lord Mayor of London – the purchaser decided to keep the name. Davies expanded the Pimm’s brand to five new oyster bars around the city and succeeded in making his drinks such an integral part of Victorian life that throughout the empire from Delhi to Khartoum, Pimm’s was refreshing the British troops, tommies and officers alike. And, until the outbreak of the second World War, Pimm’s was the drink of choice for any self-respecting Britisher. This enduring popularity bringing forth a 4th “cup”, this time based on rum. 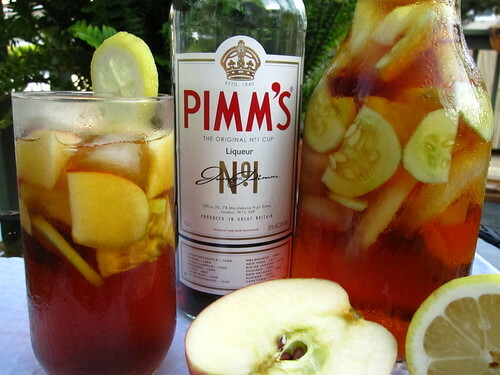 During the 1960s, when Britain, and particularly London – with the arrival of the Stones, Kinks, Beatles, and The Who – became cool again, sales of Pimm’s, which had dipped in the post-war years, took off. Daring to reinvent itself as the drink of the trendy, swinging classes instead of the stuffy, buttoned-up Victorians, the company launched two new cups, numbers five and six, based on rye and vodka, to great acclaim. Ever the fashion-conscious beverage purveyor, Pimm’s capitalized on the latest era of Brit-pop cool – the mid-1990s – when Blur and Oasis were kings of indie rock, to release its ready-mixed cans of Pimm’s & Lemonade, and in certain places, Pimm’s on tap. 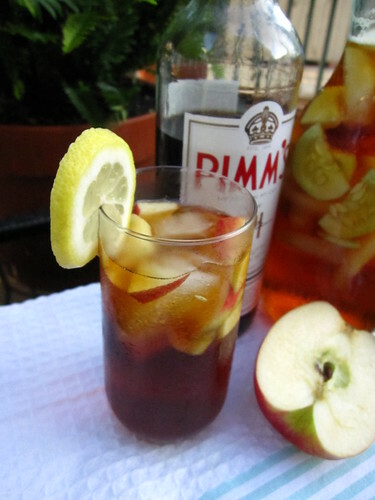 Sadly, throughout it’s long, chameloenic history, Pimm’s has been out of fashion as often as it’s been groovy. 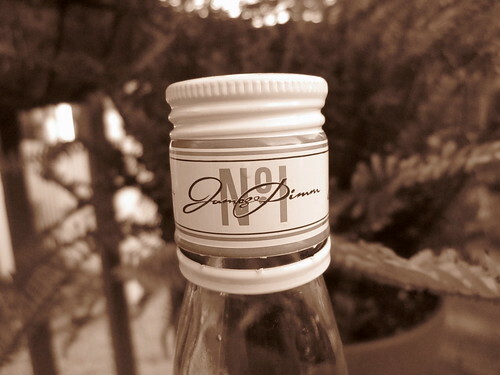 Between 1970 and 1990, many of Pimm’s cups were phased out, with only numbers 1 and 6 currently still in regular production. The no.3 cup, based on brandy, is still sold but only seasonally nowadays as Pimm’s Winter Cup. In my lifetime, Pimm’s has mostly been associated with watching a cricket match, or watching things float by from a beer garden by the Thames, while scorching my pinkish skin scarlet under sunny skies. However, you don’t have to be British, in Britain, or even interested in British mod-style music to enjoy Pimm’s. Wherever the sun is shining and it’s approaching Pimm’s o’clock, there’s an opportunity to slice-up some fruit (strawberries, apples, and oranges are good), cucumber (not just for sandwiches), and mint leaves, mix yourself a large jug of Pimm’s and lemonade (lemon/lime soda is fine), and watch the sun fall into the sea. And, lest you wonder why we’re promoting a British drink on America’s no.1 (pun intended) holiday, I should remind you that every year on or around Independence Day I am asked, by more Americans than seems possible, how we celebrate 4th July in England. Thanks for the reminder guys! I haven’t had a Pimm’s this year yet, and it’s the Wimbledon final tomorrow…I add borage leaves to my Pimm’s too. My great grandmother, grandmother and mother were always drinking Pimms mixed one way or another – I haven’t had it in ages. Your mix sounds lovely. Oh I love a good Pimms Cup. I have some in the bar and will have one tommorrow now using your recipe. Like all the back story bit…. It is indeed pimms o clock (well not quite, it’s still only 10 30 in the morning here, I mean seasonally speaking) and this is a timely reminder that I have not had a glass (jug) yet this year. 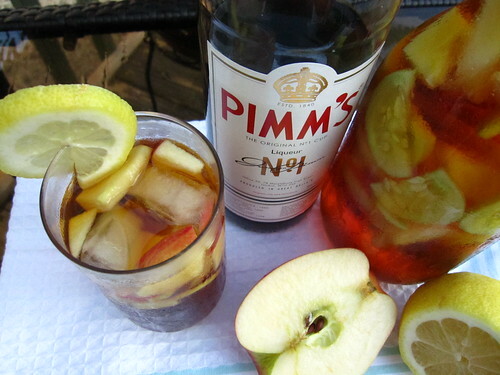 For me, Pimm’s IS the British stereotype and reminds me of wonderful summers past spent in various parts of England. Even though it’s 10:30 a.m. on a Sunday morning, I now find that I’m craving Pimm’s #1, but also being at a pub with a deck, and watching ducks float by after a satisfying day of hiking. And I second or third or whatever the cucumber. Yep, that’s kind of a sad question. I hope they ask about England’s 4th of July, by accident, then remember what it is really about, like a slip of the tongue, rather than truly not knowing??? Oy. I remember your tart from last year Amy, really like that, so summery. And Jonny, your beverage posts could get me to drink anything you recommend. Hope you are having a fabulous holiday weekend! All time favorite drink! Little that I know the history behind my favorite drink. Had one of these for the first time last week. A classic! Ahhhh, the perfect summer drink! That looks wonderful. I had one at Wimbledon last week and it cost me (don’t fall over) £6.30, and that was mostly ice!! nicisme!!! that’s insane – but we have to pay about $9 at a yankees game to drink pisswater (aka coors light). they do it cause they can! Thanks for that. I’ve been reading about Pimms and hearing about Pimms in British TV and books for years and never knew exactly what was in it. Then of course there are the Pims cookies, which are nothing like the beverage, but for a commercial cookie, are pretty darned good! It’s only 11:19 a.m. and that drink looks more than refreshing! OK, but wait- how DO you celebrate the fourth in Britain? LOL, I supppose those must be among the 94% of Americans who can’t name the Speaker of the House. Thanks for the Pimms history. In summer there’s always a bottle of Pimm’s and a six pack of Sprite sitting in my bar. The conversation may long be on pause, but I felt I had to add my variation. I was married to the most English of men for nearly a decade, and apart from being able to explain cricket to my fellow North Americans, he also gifted me with the best Pimm’s recipe ever: 3 parts Pimms, 1 part gin, poured over a generous salad of sliced apples, strawberries, cucumber (! ), and a handful of torn mint, with two generous handfuls of ice. One jug is enough for a robust couple to sleep away an afternoon in an English garden. Magic! Just found this though Tastespotting and am so grateful. As ex-pats in Switzerland with a BBC cable package, we see more than our fair share of Pimm’s advertising, and have been looking for a good Pimm’s and lemonade recipe. Looking forward to giving this a whirl when (if) the weather warms up here. @HannaJane – sounds like your english husband gifted you two of the three British essentials: Pimm’s and cricket. The third, the way to explain football’s (soccer’s) offside law, often takes longer than 10 years. I had my first Pimms No1 Cup at a Tom Douglass restaurant in Seattle. Served with a long slice of cucumber, gingerale and lemon, I loved it! Where can I find a bottle in California? 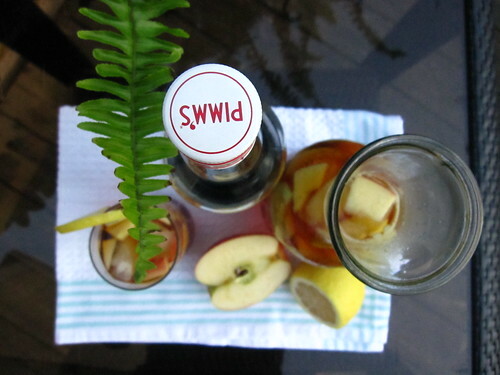 @Sheryl – glad you liked your first Pimms, and thanks for your comment! 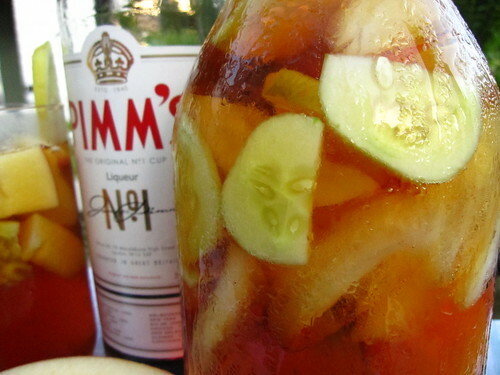 Many decent liquor stores will have Pimms’ somewhere on their shelves. You will probably have to ask for it though, since they’re unlikely to be selling a ton of it, and it’ll be hidden somewhere at the back behind dusty bottles of digestives from small Latin countries. I have had an unopened bottle of Pimm’s for two years– its life has been on an open shelf (in the sub-tropics) with no particular attention to being kept cool or anything of that sort. Is it likely ok to drink?? ?